Koyasan, Japan -- As the train left Osaka and headed toward the lush hills south of the Japanese city, I felt very far from home. The small train stopped every once in a while, letting people off on diminutive, deserted platforms. When it eventually slowed and pulled into the last stop, I was one of three people to switch to an even smaller train. Winding its way up the mountain, it finally dropped us at a cable car station. The final leg of the journey was harrowing -- a five-minute cable car ride that felt completely vertical. At the end of the climb, I arrived at my destination: Koyasan, a mountaintop town brimming with Buddhist temples. I had read about Koyasan, one of Japan's holiest sites, in a book called The Rough Guide to Japan (Rough Guides, 2005, $39.99). Fifty-three of the 117 temples there take in visitors and invite them to participate in the monks' prayer ceremonies. It sounded intriguing. Koyasan is 50 kilometres south of Osaka and about 1,000 metres above sea level. It has a long history, starting with a monk named Kukai, who went to China to study Shingon ("true words") Buddhism in 804. The monastery he founded in Koyasan in 816 became the head of the sect. When I arrived at Rengejoin, the temple I had booked, I wasn't sure what to expect. According to the Rough Guide, "foreigners are assured a warm welcome at this lovely old temple, founded in 1190." The book was correct. The monk who greeted me was kind and spoke English. He explained that I was welcome to join the daily meditation session at 5:30 p.m. and was also invited to join the monks' prayer ceremony (called "otsutome") at dawn. My dinner and breakfast would be provided. Another young monk led me to my traditional Japanese-style room, complete with sliding doors, tatami mats and a small, low table where hot green tea and a small wrapped snack greeted me. 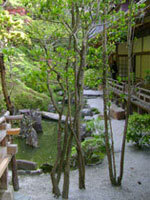 As I settled in, I could hear birds singing and water trickling in the beautiful Japanese garden facing my room. I could also hear people talking a few rooms down -- the walls were paper-thin. I read about the upcoming meditation, called "ajikan," from a booklet on the table. "Through meditation, one may wash off the dust and dirt from one's heart, awakening to the same pure heart as Buddha," it said. At 5:30, I went to the main temple, a small, dark and ornate room that smelled of incense. I was joined by about a dozen other tourists, none of them Japanese. The mountain air was cool, so it was a pleasure to discover the mats we sat cross-legged on were heated. We remained in silence for 40 minutes with two monks, one of them the chief priest of the temple. Even though my ankles were numb and my legs were sore from being in the same position the entire time (a common feeling among the tourists, I later learned), the time flew by.